Upon the death of Edgar Daniel Wilbanks, Patrick L. Bohannon learned that his two children with his late wife Mary Frances Wilbanks were entitled to share in the distribution of Grandpa Wilbanks’ estate. Loy and Pearl Bohannon were to each receive $30.61½, according to the final report of estate administrator Ezekiel Alexander. Since the children were minors – Loy was nine and Pearl, seven – Patrick needed to have himself identified as his children’s legal guardian in order to claim their inheritance. He did so on 23 May 1908, in the Probate Court of Searcy County, Arkansas. Appointed as sureties on the bond were Shem Easley Hollabaugh and John Henry Graham. Shem Hollabaugh was a big deal in Searcy County. He had been a schoolteacher, county examiner, deputy sheriff, postmaster of Marshall, director of the Marshall bank, and in many more positions in business and government. At the time he was appointed surety of this bond, Hollabaugh was serving as a member of the Arkansas House of Representatives. In contrast to Hollabaugh, John Henry Graham was an unadorned farmer from up on the mountain above Marshall. He also was the older brother of Mary Frances Graham, Patrick Bohannon’s third and then current wife. It appears as if the form was entirely filled out by Hosea Kelling, the county clerk. All of the handwriting is the same, even the signatures. Bohannon is spelled Bohanan throughout. Hosea was crippled at the age of twelve and used crutches to walk. He began serving as clerk of Searcy County earlier that year. He later came to own newspapers in Marvel and West Helena. 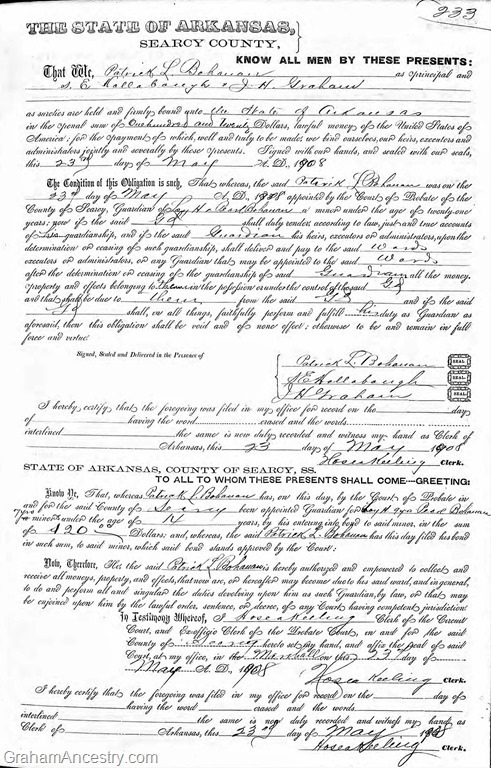 On 29 May 1908, the probate court of Pottawattamie County, Oklahoma issued the inheritance checks to Patrick Bohannon. Due to an error by the probate judge, the checks were for the incorrect amount of $29.94 each. Ancestry.com has images online from the Searcy County court, but does not appear to have them indexed and searchable as of this writing. I discovered this guardianship form while browsing through the images of the court records. It lead me to discover the probate records of Edgar Daniel Wilbanks, which are indexed, and thus to the recent string of Wilbanks-related posts on this journal. Ancestry.com. Arkansas, Wills and Probate Records, 1818-1998 [database on-line]. Provo, UT, USA: Ancestry.com Operations, Inc., 2015. Original data: Arkansas County, District and Probate Courts. Accessed 12 March 2019. Ancestry.com. Oklahoma, Wills and Probate Records, 1801-2008 [database on-line]. Provo, UT, USA: Ancestry.com Operations, Inc., 2015. Accessed 12 March 2019. Allsopp, Fred William. History of the Arkansas Press for a Hundred Years and More. Parke-Harper, 1922. Google Books, https://books.google.com/books?id=gdA3u6qwI3QC&pg=PA1#v=onepage&q&f=false. Accessed 12 March 2019. Hempstead, Fay. Historical Review of Arkansas: Its Commerce, Industry and Modern Affairs, Volume 3. Lewis, 1911. Google Books, https://books.google.com/books?id=hD9EAQAAMAAJ&pg=PA1097#v=onepage&q&f=false. Accessed 12 March 2019. Osterdahl, Andy. “Shem Easley Hollabaugh (1869-1957).” The Strangest Names In American Political History, Blogspot, 25 Jan. 2019, http://politicalstrangenames.blogspot.com/2019/01/shem-easley-hollabaugh-1869-1957.html. Accessed 12 March 2019. Previous Article Maximum Death Rage!